Built by Grumman. Assigned to the US Navy (USN) to squadron VT-21. No known nickname, nose art or squadron number. On July 14, 1943 piloted by Lt. Alfred F. Jacobsen, 124104 this Avenger was damaged by anti-aircraft fire while operating from Guadalcanal. 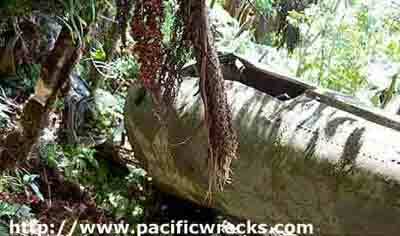 Afterwards it was repaired and assigned to CASU-10 based in Espiritu Santo. On August 22, 1943 took off from Espiritu Santo on a local area flight and crashed. The pilot and radio operator were killed in the crash and officially declared Missing In Action (MIA). Baker survived and was rescued sixteen days later. During 2000, the wreckage was discovered on Espiritu Santo. Esterl and Scribner were officially declared dead the day of the mission. Both are memorialized on the courts of the missing at National Memorial Cemetery of the Pacific (Punchbowl) on the Courts of the Missing. After the recovery of remains Scribner was buried at Fort Snelling National Cemetery at section 1, site 552. American Battle Monuments Commission (ABMC) - Clarence L. Esterl "recovered and identified." American Battle Monuments Commission (ABMC) - Harry C. Scribner "recovered and identified." Thanks to Ted Darcy for additional aircraft and mission details.